Update, 1/12: Moved the "Screenshot or Photograph" survey below break-- click pic or "Continue" to take it. Last week when I featured Vint Falken's handy guide for using Photoshop with Second Life images, I described her as an "image maker". This provoked a stern reply from Vint, who prefers to be known as an "SL photographer". She has a compelling argument for that title: Residents who use Photoshop to create textures for SL clothing are called "fashion designers", Residents who arrange 3D blocks together are called "builders", while Residents who rotate their avatar around a cylinder are called "strippers". "[I]t is only rightful," she concludes, "that you refer to those who make the biggest part of their virtual income out of taking portrait shots of avatars, as 'photographers'." What's more, many SL images are drastically altered in programs like Photoshop. A lot of real world artists use photographs as their medium, staging them in fictional narrative scenes, say, or even painting on top the actual photo, and because of that very process, they're not called photographers-- they're called artists. It's why I call Residents who contribute to my New World Tableau series as "Residents who've turned SL screenshots into a new art form." So that's my case. But again, Vint makes a strong one herself, and so I launched the survey above-- vote by the 18th, and discuss below. Let's see what the collective opinion is, and go from there. If there's a decisive majority in either direction, I'll probably cede to the democratic will, at least in some instances. The debate reminds me somewhat of the discussion that apparently took place in the 50s and 60s, with the gradual emergence of purely artificial music - was a synthesiser a real instrument or not? Were practitioners musicians, or technicians? It may seem silly to us now, but, plus ça change.. I'd almost be tempted to adopt a new word for the activity, but "photographer" meets the need, without adding complexity. There's no doubt, after all, that a worthwhile SL picture relies on many of the same artistic skills as RL photography, whilst harnessing different mechanisms for capturing the image itself. It feels fitting that the term "photography" belong to those skills, rather than the means by which they arose. In language, my field of expertise, it works like this - if everyone understands the meaning of a word in a new context, it can (and will) be adapted. And so she is a photographer, much like the driver of a car is still called chauffeur, although there is nothing to be heated anymore before the ride (chauffer = to heat up). I prefer to call the result of her work an image though, being not a screenshot (which is a raw, clunky SL 'snapshot') but also being not a photograph (as per Hamlet's description). It doesn't really bother me one way or the other... the only thing I feel quite strongly about is that it really doesn't matter what you call it. It's missing the point. I agree with Porsupah that this kind of thing seems to happen with technical leaps... lots of people seem to feel the need to create new categories, which is fine if it helps them. But for me, if someone tells me they take photos in SL I know exactly what they mean. Are the avatars on my friends list really my "friends"? Does Pixar make movies? Or maybe is Finding Nemo machinima? I don't think "screenshot" is accurate, and in fact I find it kind of offensive when applied to an image that has had much art and craft applied to it. But I also don't don't think "photograph" is the best word. If you try to find the etymology of the word 'photography', what will you find? More or less, a way to 'print' 'light'. There is no more silver film, there are memory cards. IRL, we already 'digitalize' still pictures, then we potoshop them sometimes to a point the image is 'surreal'. ISL, people can fly, but they are still called 'humans', or 'people'. We are ISL. SL allows us to move the sun as we want, great. We just 'print' some 'SL light' on our HDs and photoshop them to make nicer 'photographs'. And I love the possibility to close the angle of my camera to make better portraits! Whatever term gets used the most, regardless of technical accuracy, will usually succeed. Look at "podcast" for example, and how it's used OUTSIDE of many iPod-based contexts. I view "photograph" (or even "digital photograph", not to be confused with captures of analogue subject matter) as a transitory term towards something which we haven't conceived today. Not unlike "machinima" (which is a mouthful to say and still reminds me of "paper mache"). Is it art? Does it matter what it's called? Yes, especially to those who find more meaning in words than actions... those who quibble and debate, struggling to pin down a fast-moving fish, will quickly be leapfrogged by those who continue to create wonderful things, as undefinable as they may be now. I learned this lesson during my tenure with techno music and its shattering array of sub-styles. And also remember, the Renaissance wasn't called that during those great artists' lives. Right now, I'm closest to "photographs", leaving room to change and grow. What a great discussion--I'm looking forward to seeing the results of this poll. I consider myself a photo-artist who works with digital images. I'm sure that someone will come up with better language as the art form evolves. i would think the term "mixed media" works best. Used in RL to describe almost any object or image that use's more than one technique or material. When an RL photographer needs more light, he can't just move the sun where he wants it. So, photography, imho, is always just a representation of reality. Why can SL photography not be a representation of virtual reality, as seen through the eye of the photographer? A famous photographer for instance, her name slips my brain & finger - takes almost doll-like photographs of children: 'cold colours', huge eyes (photoshopped), ... . It's typical for her work. Yet, it is still called photography. So I think the fact that the image went through PS, is not a good reason to call it 'non-photography'. Especially now we came in the time of digital photography - almost no non-digital compacts are even produced anymore, cling on on the ones you have if you like film - the only difference I still see is that SL photography does not catch 'reality'. But that as what happens in Second Life is real for Second Life, yes we are photographers. As someone who makes clothing texture will tell a RL friend that does not know SL, she makes clothing texture, and tell an SL person she's a fashion designer, I still think that when seen from in-world perspective, we are photographers. Artists in SL, whether visual or peforming, have always had the challenge of trying to define whether or not what they do is real art. For example, I DJ in SL, so I am considered a DJ in that sense. I also do sculpture in SL, so I am an artist. In Second Life, we are given the opportunity to do things that we would otherwise never be able to do. How many SL fashionistas and designers can actually sew? How many SL real estate moguls could actually compete in RL property sales? Personally, I would go cross-eyed if I was put in front of a real DJ deck, or would burn myself horribly if I tried to use a blowtorch to do an actual metal sculpture. But the creativity and talent that these artists possess is very real. Anyone can hit the "snapshot" button in SL, but it takes a good eye and an excellent sense of balance and design to make a simple virtual photo into something beautiful. Whether or not they are "real artists" is niether here nor there. What matters is that what they do enhances the Second Life experience. And isnt that what art is supposed to do? The term 'photograph' is accurate the way you put it. As in a photosensitive material being burned with light. Even a picture taken on a digital camera isn't really a 'photograph' according to the strictest definition of the word. As for the result of a 'screen shot' taken from SL - to me they are more than screen shots. After all, you can set the captured resolution to much higher than your screen's actual resolution. Thus, the image isn't really being captured from your 'screen' - it is being generated on the fly, based-on what is on your screen. 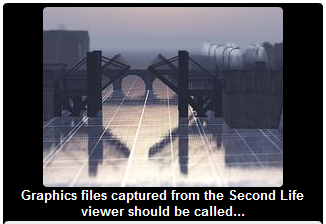 So, if it's not really a photograph and it's not really a 'screen capture' - then what is it? I refer to them simply as 'picture art' or just 'art' (Real life photographers also refer to pictures as 'art' or 'picture art' very often.) I certainly don't refer to them as 'screen shots'. As for the person taking the picture... 'photographer' is certainly appropriate for many SL 'picture takers' whether they pass that art through Photoshop or any other 'desktop' tool or not. They are still photographers. Being a 'photographer' is a process of envisioning the image before it can actually be seen - anywhere. You look at the scene and mentally place your camera around the vicinity, imagining the viewfinder to obtain the look you want. Then, position your camera there and decide if it's what you saw in your mind's eye. So a really good picture is rarely accidental. This is true in SL, too. And, just like real life, most people who take picture art in SL don't know how to take pictures (90% background where the subject is a tiny speck in the center of the frame.) Thus, they are amateur picture takers, not 'photographers". Granted, these are only my own definitions and perspectives. But it helps me to explain my own point of view. Thus, even in SL, the term 'photographer' would not always apply. Just like real life, a 'photographer' is a 'professional picture-taker' who is able to 'capture' stunning and beautiful imagery. The same should apply in SL. So, my answer is: Average person in SL = 'picture-taker' = A person with a photographer's eye = "SL Photographer" - the end product created = "picture art". I think there are two questions. Is the product of what someone like Vint does art? No question, yes - there is talent, emotion and expertise applied in the creation of it, and if executed well, it will evoke an emotional response in the viewer. Is the product a photograph? To my mind, yes also. How different is capturing an image to my hard drive of the effects of light and wind on objects in the SL world that different from what I do when I take a digital photograph in the atomic world? And to say that you can't control the lighting or sun in RL photography ignores the 'art' that most film and digital photographers have always applied to their work. The meaning of 'photograph' in the real world is changing. Often, a picture will be manipulated one way or another before being publicized. Colors enhanced, lighting added or changed. Women will look prettier, and there's the story about that Reuters photographer who photoshopped extra clouds of billowing smoke on a war picture to make it look more dramatic. So what's a photograph these days? In more and more cases, the picture you see will be a computer manipulated image, not a 100% honest representation of what the camera captured. So, I don't really care. I like Torley's suggestion to use snapshot, but I don't mind people calling it photographs. I might have chosen your poll for "images" but I don't think they're the same as "screenshots." Since the two were in the same selection, though, I had to choose "photograph." "Photographs, after all, are created by exposed light hitting a film or data strip. That doesn't happen in Second Life." Clothes, after all, are created by sewing pieces of cloth together. That doesn't happen in Second Life... yet you have referred to a "new line of spring dresses" in SL. Again... what is special about photography? People will find the nomenclature that suits the meanning they desire to convey, so I'll sit on the fence on this one. Having said that though, photographs in both worlds these days are no longer as fixed as they used to be, thanks to the prevalence of Photoshop and the gradual reassignment of meanings by the audience as to what a image or a photograph should be. Very interesting times, to be sure. A crucial point, I feel, was made by Laetizia, Rob, and Torley - ultimately, if you use a particular word, do people know what you mean? We're continually evolving many words' etymology, after all. This does, of course, also have practical ramifications - as I understand it, Flickr was (were?) once quite uncomfortable with SL photography, later easing it in if it were tagged as "not to be included in public searches". I'm not quite certain where it rests now, but there are plenty of SL pools around, not least the main Second Life one, but also ones with a Windlight emphasis, non-human avatars, and more. As a past and present, professional real life photographer working in SL I would say the skill-set required for both Virtual Capture and Real Life Capture are the same. To me the real skill in photography is the steps to achieve a final image that has meaning for those looking at it - contextual or not. The key elements are composition, light and subject and all of those can be manipulated in real life or virtual life photography. To say you can't control the sun misses the point - the fact is in real life landscape photography you wait for the sun to get into the position you have pre-visualised for example or you use artificial light and filters. Either way you are in control. I often have to comp in extra layers into a real life image anyway to reach the pre-visualisation moment. Even one of the traditional photography greats Ansel Adams used to spend hours in the dark room, burning in or holding back parts of the projected negative which had already been filter during exposure. In effect creating a non-reality. Often a key differentiator between say 'traditionalists' in music/photography is "oh you created that in minutes, my art takes hours/days/years so yours is less valid". Nonsense. Often the creative spark is just that, a moment and SL and other computer tools allow the gap between the spark and the 'shared' result to narrow. As a trained orchestral composer I also see this prejudice in the use of music tech - you use the tools that you want to use and you don't pay attention to those wishing to create labels or deciding if what you are doing is valid.